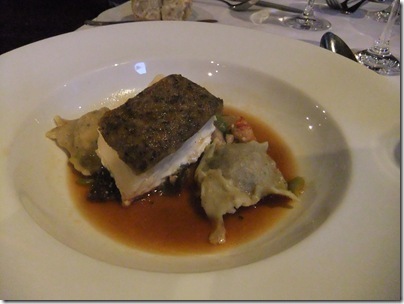 White Wine With Fish, Red Wine With Beef….An Old Wives Tale! So many wine enthusiasts still believe that you should have white wine with fish and red wine with beef. Sommeliers like myself, have learned years ago, that phrase is nothing but one of the many old wives tales related to wine. It’s not about the TYPE of Protein that guides our decision but about the TYPE of Preparation of that Protein. 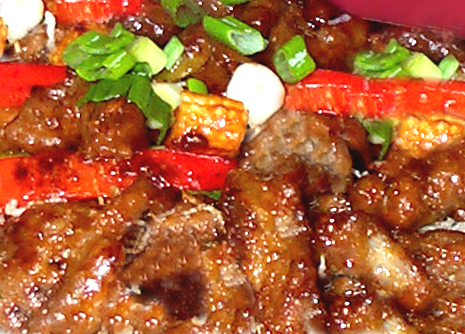 Here….you try to guess what goes with this dish. This is a Mushroom encrusted Halibut in a Shitake Mushroom Broth. Did you say White Wine? If you did you were WRONG!. The earthy Mushrooms that are crusting this white, delicate fish along with the earthy broth made from Shitake Mushrooms add lots of earthy notes to this dish and that would call for a RED WINE that complimented the earthiness….maybe a young Cotes Du Rhone or an Italian Sangiovese Blend. Double or Nothing??? Fresh grilled Wild King Salmon (Chinook), one of the fattiest of the Salmon Species. What do you think? If you said a chardonnay or sauvignon blanc you wouldn’t be totally wrong however, I believe nothing goes better with this Omega 3 Fatty Acid dish than a nice Oregon Pinot Noir. 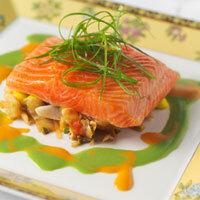 All the fatty fish dishes like Tuna Steak, Salmon, Rainbow Trout, seem to pair better with a juicy red than a White Wine. Ok, last chance! Spicy Asian Beef Stir Fry. Are you thinking it’s time to bring out the Cabernet for that Beef? Again, it’s not about the Protein, but about the preparation. The only way to offset a spicy dish is with a White Wine with a Touch of Sweetness like a Mosel Riesling or an Alsace Gewurtzraminer. I don’t know why my selections have you confused. They do this all the time in the food world! The reason there are so many spicy, mango or pineapple salsas, is because the food industry is trying to do the same thing I am doing with wine with food. 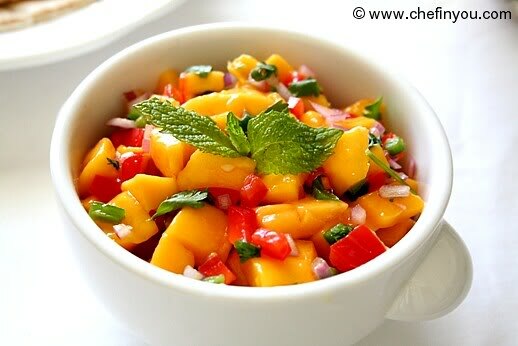 They are offsetting the spice from the salsa or hot peppers with something sweet like a mango or pineapple. It’s called Sweet and Heat Cuisine. Chef Bobby Flay always puts a drop of honey in dishes that contain hot peppers, just to balance out the hot flavors. Now if you are just cooking up a fatty ribeye on the grill, then the choice would be a nice, big, full bodied red but dry rub it first with chile flakes and ancho chiles, I would suggest a slighty sweet white again. So think about the preparation of your food rather than the type of food next time you make a wine selection or drink whatever you want. Afterall, the best wine to select with your meal is still the wine you want to drink. Just don’t pair anything up with White Zinfandels…but that’s a whole entire article for another blog. Absolutely agree with you. I’d prefer red wine in cooking, also when making meals with fish. My idea is drinking wine with meals you like most and not according to some stated ideas: That particular wine pairs well with particular food. PreviousI Admit It. I’m An Oregon Pinotphile! NextThe Most Important Factors That Make Wine Taste Better!